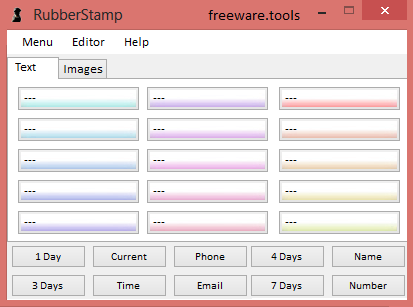 RubberStamp is a portable tool that allows you to enhance the capabilities of the Windows clipboard by storing multiple items and pasting the text or image you need with just one click. For example, the Windows clipboard is an indispensable tool for everyday use, allowing the fast copying and pasting of text pieces, files and folders from one location to another. Its most important drawback is the impossibility to store more than one item at a time and that is where Portable RubberStamp steps in. This is a portable edition, hence no installation is required to use this tool. This simple application is designed to enhance the capabilities of the clipboard by remembering up to twenty entries and enabling you to create text templates that can be then pasted much faster and easier. The advantage of Portable RubberStamp is that you can keep it on top of all the other opened windows and send the text you want to paste to the clipboard with the push of a button. There is no need to remember key combinations or go through the items of a menu. Configuring Portable RubberStamp is a simple task. The integrated editor enables you to customize each of the clipboard entries with ease and add them a suggestive title for easier identification. Alternatively, you can right-click on a button to appoint it to the text on the clipboard. Each button can be assigned a text piece of any length, as well as additional variable fields dedicated to inserting the current date and time, a person's name, a number, an e-mail address, a department in a company, a phone number of other miscellaneous data. All these fields can be easily customized in the 'Settings' area and prove very useful for creating e-mail signatures or other text templates. Portable RubberStamp is a special version of RubberStamp that does not require installation. It is a handy tool for anyone who must repeatedly paste the same text over and over again, saving a significant amount of time and improving workflow.